Still feeling under-caffeneited and bored with our usual 3-in-1 coffee sachets, we hit the road to Bonifacio Global City. With that, we mangled our way to leave the kids at home while they were having their dinner. while us, looked for a night of not just good coffee but a satisfying dinner on the budget as well. Rode the motorbike hastily, Bhogs and I, looked for a new coffee shop to cave in to our coffee cravings but veering away from the typical coffee chains. Though I'm not saying they are not that good, it 's nice that we try new ones and see for ourselves whether it's worth recommending or worth-helping. 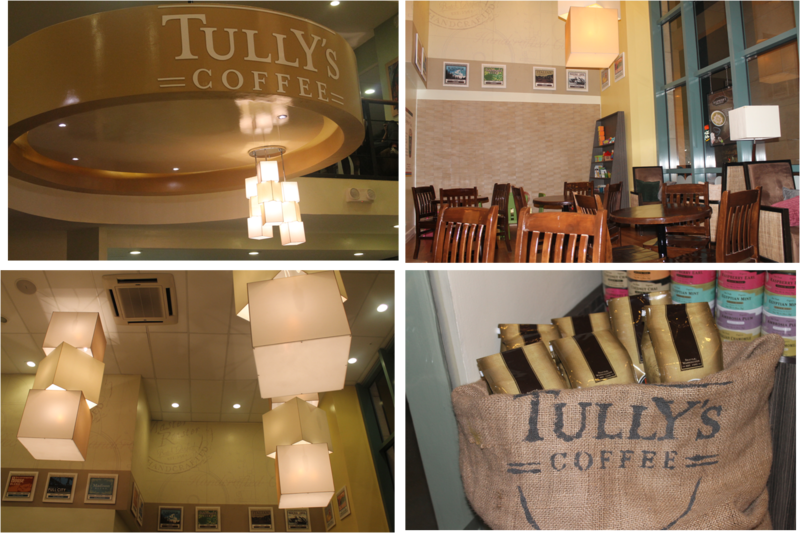 So we found Tully's Coffee, which is just along the corner of McKinley Park Residences. The ambiance is very homey, unlike Starbucks which is always crowded. 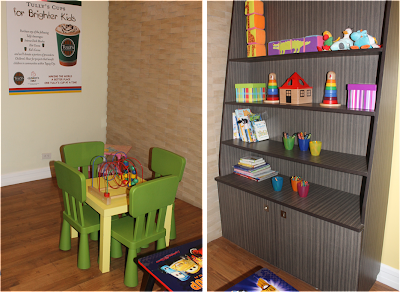 It is where you get to have a thinking cup, a cup of coffee to get your nerves stimulated and have your brain percolating, even the aroma in every corner smells coffee. So you're wondering what we had for dinner. Well, since they are still new, they haven't built up their menu yet, we were actually aiming for pasta at least, but at the moment they weren't available. Luckily, Tully's Lunch Pairs have just been launched. It is where a sandwich is partnered with salad. So for me, Grilled Tuna Sandwich with tossed Salad. For Bhogs, a big Farmer's Ham and Swiss Cheese Grilled Sandwich. Though I could notice the disappointment in his face, we didn't eat the rest of the food we ordered. Not that he didn't like it, but he was looking for something heavier and savory. So we took home with us, the classic cheese and ham quiche. Flaky pastry filled with chocolate hazelnut (Nutella, as what my son had tasted). Pardon me, this have become a habit, due to time constraints, since we could not really stay long outside the house in any time, because we could not trust anyone with our diabetic daughter, I sometimes forget to take down notes, that includes the name of the foods, or how I have tasted each one. I can't really pinpoint how this new coffee differs from the famous coffee chains that are still growing in our country. The Bellaccino, something like the Frappuccino of Starbucks, is Tully's rendition of the frosted coffee concoction in Mocha, Caramel, like the ones we had, Espresso, Chocolate, Chai and Matcha (Green Ice tea) are the choices. For the coffee lover's who like them hot, the regulars in 12 assortment with Macchiato and Espresso leading. I was wondering how Con Panna would register, too bad I only found out now that they have it. But what really caught my fancy was the children's nook. Here kids are welcome, Tully's kid's drinks offer drinkers to give in to their kids hot choco whims, while helping out other less fortunate kids. 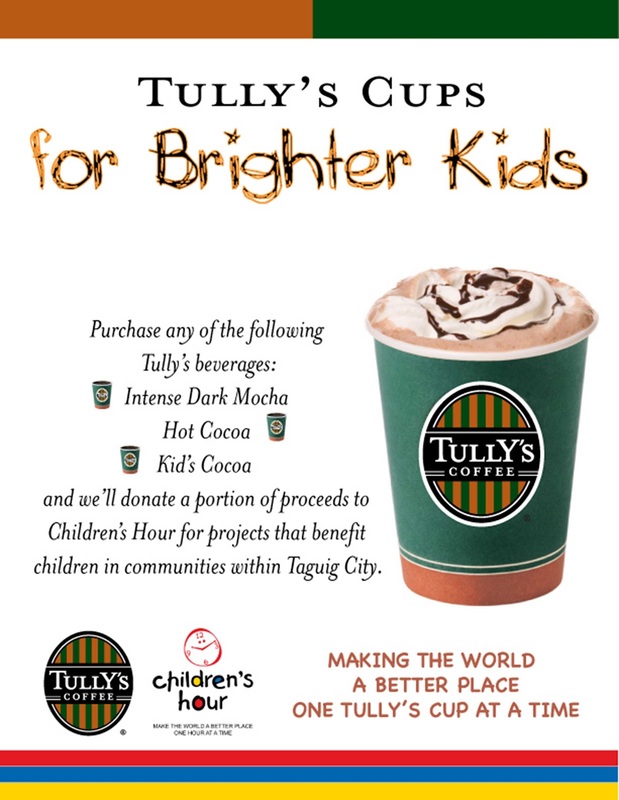 Tully's Coffee joined hands with Children's Hour. So I guess, more coffee shops will be emerging soon in our neighborhood. 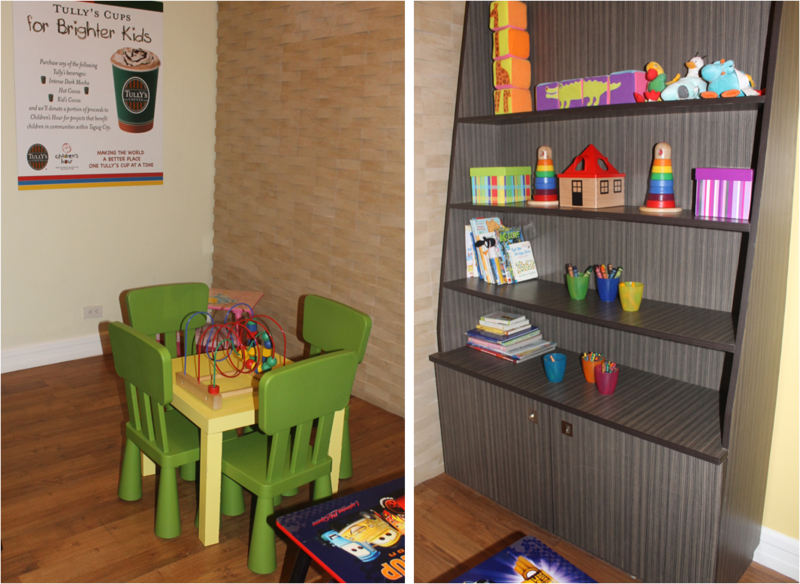 If you have kids you want to bring along to grab a sip of your favorite coffee concoctions, wait for Tully's or just visit them at their branches.